. : Optics & Photonics Focus :: Roy G. Biv Goes Nano :. Controlling quantum systems, however, is extremely subtle and difficult. The most common model currently in use, as it now turns out, is simply insufficient — a slightly more complex approach is required. A nano rainbow. The LED device (on the left side) is made of an Indium Gallium Nitride (InGaN) nanodisk held between two Gallium Nitride (GaN) nanorods. The InGaN nanodisk is responsible for the emission of light spanning through the entire visible range, from violet to red. New York: Times Square at night! The high-tech magic of its spectacular LED-illuminated billboards! Once experienced, never forgotten! Far from being a mere tourist attraction, Light Emitting Diodes (LEDs) are being more and more extensively used in both public and private lighting, and scientific research into them is a fervent topic. The latest contribution from Shangjr (Felix) Gwo’s group at the National Tsing-Hua University in Taiwan proposes a new method of solving one of the long standing issues in LED research: the fabrication of a device that can emit light of any color. LEDs are electronic devices built around a light-emitting semiconductor material. In terms of applications, the commercial success of LEDs is driven by their many advantages over more standard light sources: LEDs, for example, consume less energy, and are smaller in size, more robust and longer-lasting. The working principle of LEDs is quite straightforward. When voltage is applied to the semiconductor material, an electron in the conduction band can jump to the less energetic valence band: in the process, the difference in energy is emitted as a photon. What determines the color of the emitted light in conventional LEDs is the variety of inorganic semiconductor material employed, such as Indium Gallium Nitride (InGaN), Aluminium Gallium Indium Phosphide (AlGaInP), or Aluminium Gallium Arsenide (AlGaP). Each of these materials features a different energy gap between its valence and its conduction bands, which translates to a different color for the emitted photon: the wider the energy gap, the higher the energy of the emitted photons, the more its color moves towards the violet end of the spectrum. A LED, therefore, can only emit in one specific color; the white light we are used to from more conventional light sources, however, is composed of a mix of colors, something which a standard LED is not able to emit. The commercial solution is to employ fluorescent materials, such as phosphors, to convert the emission of a blue or ultraviolet monochromatic LED into other colors. "Efficient InGaN LEDs are only available in the blue region," Gwo explains. "As a result, monolithic white LEDs are typically realized by luminescence down-conversion using yellow phosphors." As he further points out, this limits the efficiency of the illumination and the quality of the color rendering. "Therefore, a major focus in current research is on improving the InGaN emission efficiency at longer wavelengths," that is, towards the red. Ultimately, the ability of the same semiconductor material to emit at different colors depends on how much we can alter its composition — and, therefore, its energy gap — without introducing defects and thus making it unstable. This task, however, proved to be very difficult. To overcome this obstacle, Gwo and colleagues went nano: for a nano-device, in fact, the fabrication of the semiconductor material in a defectless way is much easier to control than in a standard sized LED. 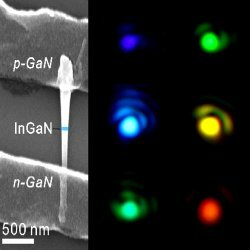 In their device, the researchers were able to grow a nanodisk made of an InGaN alloy – only a few tens of nanometers long – between two Gallium Nitride (GaN) nanorods on a silicon substrate. The InGaN nanodisk is responsible for the emission of light, and, given its tiny, indeed nanometric, size, a larger variation of the material composition is possible before defects are introduced, significantly reducing the emission efficiency of the LED. Gwo and colleagues were, therefore, able to devise nano-LEDs that emit from violet to red and that are made of the same semiconductor material. "By using this approach," Gwo explains, "we have been able to demonstrate the operation of monolithic, phosphor-free, white nanorod-array LEDs and of polychromatic nano-LEDs." InGaN alloys, he adds, "are direct band gap semiconductors that can be tuned continuously with emission colors spanning from the ultraviolet to the near-infrared region by adjusting the ratio of indium to gallium content." Not only do the tiny dimensions of the nanodisk allow for really colorful emissions, but they also mean that these LEDs are truly sub-wavelength light sources. This fact could really make the difference in terms of applications whenever efficient light sources are needed on such small length scales. "On the one hand, the potential applications of our LEDs include ultrahigh-density data storage, sub-diffraction-limited nanolithography, single-molecule sensing, and integrated optics," Gwo points out. "On the other hand, the related fundamental studies include nanoscale strong light-matter interactions, as well as surface-plasmon-based laser and spaser phenomena in semiconductor-metal hybrid nanosystems." Alexandra Djurisic at the University of Hong Kong suggests that further work is needed before this device can make it to the market and find practical applications. In this work, for example, the "electroluminescence is given in arbitrary units so that brightness and efficiency cannot be compared to existing technology. In my opinion, further work is needed." Nevertheless, she adds, "these results are interesting and promising, and it would be unfair to compare entirely new developments to well established technologies. If we do not study new things, even if in the first couple of iterations they may not perform as well as existing technologies, how can we develop new technologies?" Yu-Jung Lu, Hon-Way Lin, Hung-Ying Chen, Yu-Chen Yang & Shangjr Gwo, Single InGaN nanodisk light emitting diodes as full-color subwavelength light sources, Applied Physics Letters (2011) 98, 233101 (link).